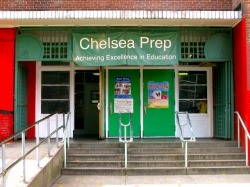 PS 33 Chelsea Prep is a public elementary school in Manhattan's District 2, with students in grades pre-kindergarten through grade 5. Chelsea Prep is proud to host a diverse community of learners. Our dedicated staff, motivated students, and caring parents work collaboratively to maintain the remarkable academic achievement that has become the norm for Chelsea Prep students. Chelsea Prep is home to a rigorous standards-based curriculum that fosters analytical thinking, creativity, and independence.